If someone had told you that, some years back when they went to Butlins Skegness, they had seen Cannon & Ball, or Little & Large, you'd have no hesitation in believing them. However, if someone told you they'd seen comic legends Laurel & Hardy there, you might think that the mixture of beer and bracing air had affected their brains. 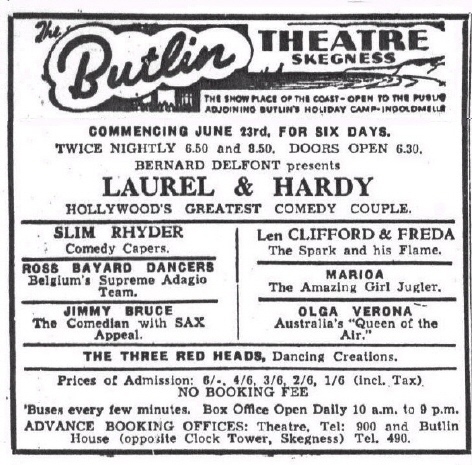 However, that Laurel and Hardy DID appear at the Butlins Theatre Skegness is a fact. Between February and September 1947 Stan and Ollie did an extensive tour of the No.1 theatre circuit in England and Scotland. The two screen comedians played Skegness week commencing 23 June, sandwiched between weeks in Glasgow and Edinburgh. On Monday afternoon, after rehearsals at the theatre, the two superstars were to be found in the Empress Ballroom, where they judged one of the heats of the 'Holiday Lovelies' competition. 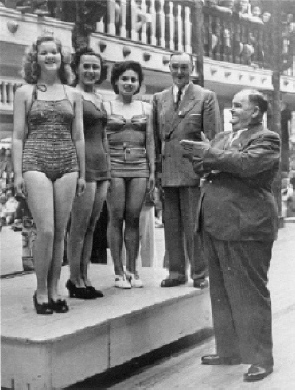 And, whilst 'the Boys' were keeping their eyes on the girls, their wives - Ida and Lucille - were keeping their eyes on them, by making up the rest of the judging panel. There was less beauty to behold in the competition which followed, namely the 'Knobbly Knees' competition - in which elderly men, with their trouser-legs rolled up, were subjected to a series of humiliating tasks. 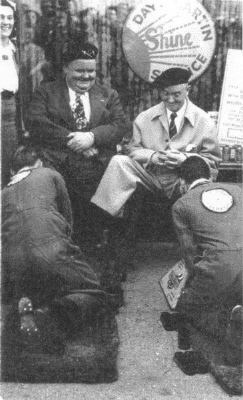 shoe-cleaning service provided by Day & Martin. Just two of many photos of Laurel and Hardy at Butlins in 1947. If you have any more, or know someone who was there at the time please contact me. On Tuesday afternoon the Laurels and the Hardys were out on the Gloucester Green, judging junior competitions for boys, girls, and toddlers. At other times, they were photographed participating in various leisure activities, such as roller skating, and riding around the Ingoldmells Hotel on one of the Butlin's fun-bikes. And, later in the week, they spent a bit of time with Billy Butlin himself.